I often find myself in front of the computer trying to prepare a route. This usually happens because I have seen a place on the internet, TV or someone has told me about this cool place they visited recently. When this happens, I always think about visiting on my bike, this way I can enjoy the route and the destination; it’s a win win! In this post I will explain how I prepare exciting motorcycle routes when I have a start and end point, using MyRoute-app. 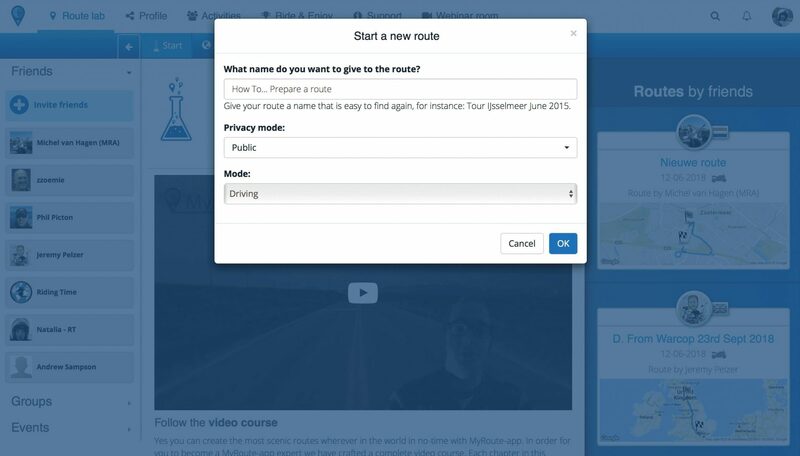 Create a new route – Name the route, select a privacy mode and a mode. Make the name relevant, this is important, you may need to search for it in the future. The privacy mode depends on who you want to be able to see the route. I usually create them as private until they are finished, when I then change them to public. For the mode, I use driving, MyRoute-app uses driving as default, and this also applies to motorbikes. Add the start and end point – This will automatically create a route that you can later play with and modify. Adding the start and end points. Research research research! – Forgive the emphasis but this is important. The internet is your friend here. I find sites like the National Trust or English Heritage are good sources of information. On these websites you can find lots of places to visit and information about them. They also offer memberships that allow you to visit most of the places for free. I also like researching on Facebook groups and biker sites to find interesting roads and other places where I can find local bikers with whom I can chat with and get ideas from. I like castles so I always try to add some to my route. Map of National Trust sites. Add Points of Interest (POI) to your map – Once you have a list of places you want to visit, add them to your route and place them in order so the route makes sense. Route with POIs in it. Avoid cities and motorways – Unless I want to see something specific in a city or want to get somewhere quickly I tend to avoid both cities and motorways. Around cities there is usually a lot of traffic and motorways are boring! Aim for the green and twisty – Now that the route starts to look interesting, I aim for the green areas of the map. Green areas in a map usually mean nature and less civilisation, which translates to beautiful scenery and less traffic. Another thing I do, is to try to identify twisty bits of roads. This can be mountain passes, routes along rivers or through forests. All of these are interesting for motorcyclists, plus they add great views to enjoy. For this, you can click on the route and drag it to a road you want the route to go through. Route with POIs and twisty bits in it. Plan your lunch stop – Whether you go for a short route or a long one, stops are necessary to make sure we keep hydrated and maintain concentration. I tend to research a lot to find good lunch stops. I like stopping at biker cafes where I can chat with locals about bikes, routes and roads around the area. You may find some ideas in our Food Reviews section. We usually stop every hour and a half, this works well for us but test it when you go our for a ride. What works for us may not work for you. Plan petrol stops – This may not be necessary depending on how long your route is but it is always good to know where the closest petrol station is. Export the route – MyRoute-app has an export option built in. This avoids the need of extra software to get the route on your satnav. Double check – It may sound redundant but I always double check the route once it is in my satnav. It is useful to compare the route in your satnav with the one you created in MyRoute-app. Sometimes, due to the configuration your GPS uses, the route may change slightly making it confusing. Jump on your bike and enjoy the road! Remember, if you subscribe to our blog, you will get FREE access to ALL our routes!